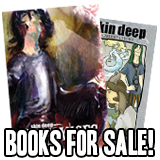 Skin Deep is back yaaaay! We’re back in the Liverpool Avalon for this story! It’s about a bugbear talisman! 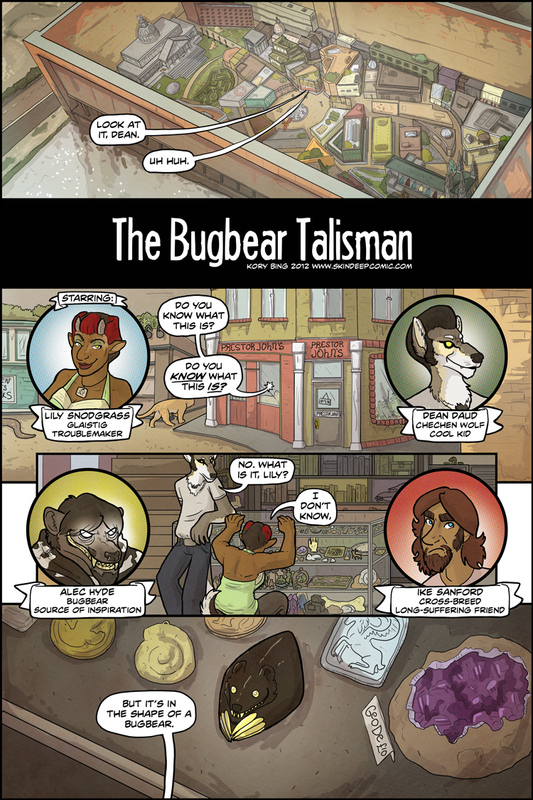 What is a bugbear talisman?? Keep reading to find ooouuuuttttt! dude i can see her too the Medusa chick’s hair. Ha, I didn’t even notice that! I wonder if it’s intentional spying, or if she’s just on the other side of the door. Well CCTV is going to be no use to her whatsoever, how else is Madam U gonna keep an eye out for shoplifters? I had to use Ctrl+ to zoom in like 6 times to find the Medusa Hair peeking over the door. YES! Ever since I saw Eric I’ve been HOPING for a bugbear-centric arc! Hmmm… is that the Nightmare skull on one of the shelves? Surprised a certain shop keeper hasn’t told them off for loitering around the counter. Also, nice view of the Avalon exterior. Yayy! Alec is great, but I love Ike! Can’t wait to get to know Lily and Dean! Question: Is this before or after Exchanges? Loving the rockabilly wolf dude! Yeah, I can totally see this guy rocking out to Elvis. A glaistig is basically a Scottish, female version of a satyr. Wheeeheee! I enjoyed the “drawing of” videos, but the best thing is (as ever) reading a new page here! Question: Are glaistig similar to satyrs in appearance only or are there cultural links like fauns? There are a few cultural links, to be sure, but glaistigs are very vocal in the fact that they are Not Satyrs. Yay! A new page!! It’s always great to see an update after a break. Will you be back to your regular schedule from here on out? Also, I can’t begin to say how happy I am that we’re back in Liverpool. It’s just such a visually interesting place and I adore how you draw it. I guess I should be looking forward to lots of background cameos from other characters here and there just like in Exchanges, huh? Yay! Back! And yay for another harpy’s-eye view of the LA! That Lily Snodgrass certainly looks like trouble, and I wonder whether she ever uses her surname when among her peers. There’s certainly some interesting stuff in that cabinet… is that yellow thing in the middle a hand of glory? That fluorite-looking geode, though, certainly looks worth snapping up for only a tenner. And while I’d be very careful about touching that bugbear talisman, I suspect the cast won’t be. Let the fun commence! Also, I can’t remember what sort of building the avalon is in, but it must be flipping huge to be able to hold that entire city. The LA is hidden as a warehouse, so yeah, pretty big. The Stanley Dock Tobacco Warehouse is the world’s largest brick warehouse. :) Although I may have fudged the size a smidge for the sake of the comic. The SDTW is 14 stories tall with a footprint of 36 acres. you, know, there is a kid at my school who looks just like alec, but younger and without the facial hair! Even the hoodie looks similar! Crazy, right? Wow, it looks like you’re building up so many storylines, you might have to do one in B&W just to keep from being stuck in that one year for forever. … Thinking back, please tell me we finally get to know what Tony is? I love the coloring of the bugbear rock thing in the last panel! It’s really vivid. Why is Ike human? I thought he wasn’t able to turn human since he was a monster? Ike’s buggane half gives him the natural ability to shapeshift into human. I love the art for the amethyst geode. That is cool. I remember the beginnings of this comic when the art was more crude, but still enjoyable, and the story arcs have always been well written. Now, the skills and the imagination in the art matches the skill and imagination in the story telling. Masterful work, Kory! Hi Cory! I met you at PAX Prime and finally made it to your site this weekend. Spent most of it reading your whole back catalog. Fantastic, engrossing work. The panel on this page with the sky view of the L.A. is one of my favorites. Paging back through again, its amazing how well you’ve maintained consistency through the city layout. I’d love to see a detailed map of the city! (Yeah I’m the guy with notebooks of hand-drown Zork maps.) Anyway, thanks for sharing your world with us. I’m looking forward to see what happens next! Would Dean, the Chechen wolf, be a totem? I looked it up and Wikipedia says that the Chechen wolf is the “national embodiment” of the Chechen nation. 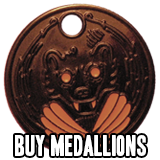 Don’t think so, Bohemian Lions are about the same and Rhonda had a medallion, and totems don’t.